I’ve had a good weekend. Time with family, local fun day, a nice time at a quiz night where we won a bottle of Whisky in a raffle and some knitting. I hane noted a couple of Perth Festival emails pop in so thats great. Monday’s to do list is sorted. Now it’s time to work on the square shawl…… see you later. Hi folks, I recorded an episode of Beardychiel’s Knitting Banter on Wednesday and got to the editing stage today. That bit is done and we wait now while You Tube lets it upload and we hope it works first time. Not a lot of knitting done yesterday, but some web bits and prep for editing and housework. Today after the editing Janet emailed for a Pancake/Drop Scone Recipe. Well it took a whole 10 minutes to type and would you know it put me in the mood for them so I made a batch. I’m thinking a Beardychiel Cooks page might be a good addition. So, I am rationing my time on the new site to an hour a day. Why? That can be explained by looking at all the other things that require to be fitted into a day. I also allow myself the luxury of a shower. 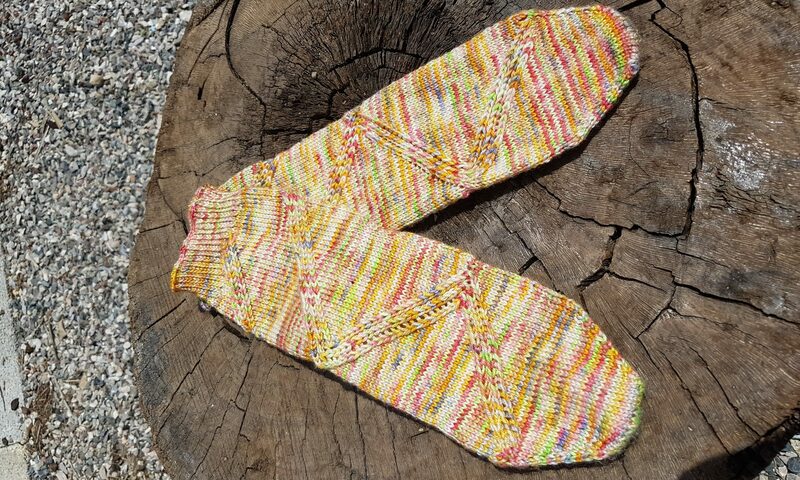 Earlier this morning I finished Tsambika’s Rhodian Sun Sock pattern and sent it to one of my test knitters. Tech editing next and then I’ll add it to this site and Ravelry. Made sure the social media links in the footer take you to the right places. And so that’s it for today, a little cooking and then Perth Festival time. Welcome to Beardychiel’s Design. In creating this new site for my knitwear and fibre crafts I am hoping to sow not only my design work but links to where all things Beardychiel can be found. Thanks for joining me on this journey.